Various types of psychotherapy can benefit people who experience depression, anxiety, and other common mental disorders. However, the extent to which these psychotherapies are available and delivered effectively is largely unknown. 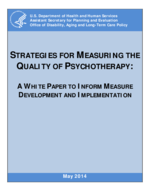 In the context of health care reforms that encourage performance measurement, a strong set of measures focused on psychotherapy could help stakeholders understand what psychotherapy services are delivered and if they yield positive outcomes. This paper discusses the advantages and challenges of structure, process, and outcome measures for psychotherapy. It concludes with several recommendations for advancing the measurement of psychotherapy.